Powered by 6- and 8-cylinder engines, the handsomely styled Audi A5 features save and sporty handling thanks to standard all-wheel-drive, and seats four passengers in a high-quality interior. All-new for 2008, the Audi A5 coupe combines beautiful looks with excellent engineering and handling. Quattro all-wheel-drive comes standard and helps to transmit the power of the V6 and V8 engines in all conditions. The well-equipped interior offers space for four passengers in a stylish environment. 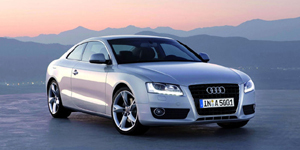 Find the used Audi A5 of your choice from a dealer in your area. Search our used car listings now.